Once again Scorpion redefines the definition of value and versatility. Introducing the EXO-AT950, a versatile modular Adventure Touring helmet. It has features and quality that you would expect to pay three times more for. 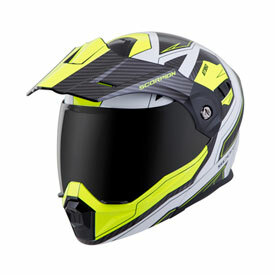 The EXO-AT950 can be used as a full face ADV helmet with external peak visor attached, or the peak visor can be removed and you have an aerodynamic touring helmet. Our oversized eye port is extremely wide for greater peripheral vision and downward visibility, and the modular chin bar can be conveniently flipped up when you stop to get gas or ask for directions. The internal drop down Speedview® sunvisor and KwikWick® II liner will keep you comfortable all day long even as lighting conditions change throughout the day. Additionally, the no-fog Everclear® face shield can be removed and you can use the EXO- AT950 as a dirt helmet with goggles for off-road use. Three shell sizes made of Advanced LG® Polycarbonate and dual density EPS, result in a helmet that is light weight, strong, and protective. Versatile, convenient and easy to use Modular design; with a single lever release that allows the chin bar to be raised or lowered with either hand. Advanced LG© Polycarbonate shell is engineered to be lightweight, strong and maximize impact displacement. Includes an advanced multi-layer EPS which provides superior energy displacement. Aero-Tuned Ventilation: Intake vents on top force cool air in while exhaust vents maximize movement of hot air out of the helmet. Easy-use Flip-up Chin Bar: A single lever release allows the chin bar to be raised or lowered with either hand. Scorpion’s ratchet system uses an elliptical motion that creates 7.6mm of travel which pulls the shield securely against the eye port, ensuring a proper seal. The Ellip-Tec™ ratchet system allows for 100% tool-less shield changing in a matter of seconds. EverClear® No-Fog Faceshield is an optically-clear shield with state-of-the-art fog-free technology, with anti-sratch hardened coating and 100% UV-A & UV-B protection. Oversized Eyeport: Wide eye port allows for greater peripheral vision and downward visibility. When the faceshiled is removed the eye-port accommodates most sizes and brands of goggles. *Everclear® SpeedView® Drop Down Sun-Visor: Retractable interchangeable internal sun visor. Choose the up or down position with an easy-sliding mechanism. Also features our exclusive EverClear® anti-fog coating on both surfaces. KwikWick® II anti-microbial fabric keeps you cool and dry in warm weather, and warm in cool weather. Liner is easily removable and washable. Kwikfit® cheekpads allow easy on and off the most common styles of eye glasses. 3 Shell Sizes: Having 3 shell sizes helps to optimize weight, fit and comfort across the entire size range of XS-3XL. Please note that the dark smoke shield pictured is not included and must be purchased separately.